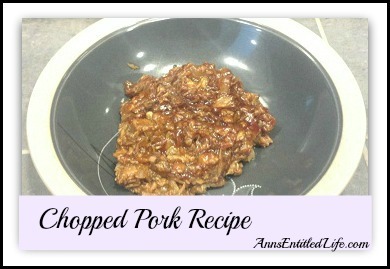 This is Hubby’s chopped pork recipe. It is pretty easy to do… much easier than shredding pork! • Place pork roast in crockpot, cover with second sliced onion. • Pour cola over the roast. • Cover crockpot and cook on low for 12 hours. • Remove meat, strain and save onions while discarding the liquid. • Chop pork on a cutting board, discard fat, skin and bones. • Return chopped pork to the crockpot, add onions and BBQ sauce. I’ve heard that cooking with soft drinks makes food tasty. What an easy recipe. Thanks for sharing! I’ve never tried cooking meat with Coke or Pepsi, but I’ve always heard that it works very well. Sounds like a delicious recipe!